If we put a glance at the evolution of the bathroom, we’ll acknowledge that John Harrington had innovated a device in 1596 quite similar to one used in our toilets. He was one of the important courtiers of Queen Elizabeth I and as such devised the apparatus for the Queen. Consequently, the term “The John” designating toilets got popularized. It is a popular speculation that a person, John Crapper developed toilet. But it is not the case in fact. The truth is that popular opinion has confused john Harrington, the Queen’s Courtier with ‘Thomas Crapper’. Crapper never invented a toilet. Actually, after Harrington had innovated the toilet, later researchers intended some modifications in the apparatus. As per true accounts of the history of the bathroom, it was Crapper who had devised vaive and siphon arrangement in 1891. This provided way out for the emergence of later modern flushing toilets. Crapper’s invention popularized the sanitary system in England. In World War-I, American soldiers were staying in the country and since “Crapper Brass” was printed over the toilet, they started calling it crapper. It is a recorded fact that about 3,000 BC, the civilization had already started using crude forms of toilets. Different civilization emerged with a range of toilet designs. However, the typical structure remains consisted of bricks with holes people could sit. The holes were further connected with the drains beneath the street level. The evolution of toilets shows that even the Egyptians had such perceptions. Archeologists have revealed that in ancient India and Pakistan, there were already water flushing toilets everywhere. The Persians are also known to have made use of this device. The ancient Romans had been distinguished for their huge public baths; the toilets were also there nearby. In the Elizabethan age, the toilets were without a flush. It was around Victorian era that the flushing toilets were being fabricated. It was that period when the link between an unhygienic conditions and ailments was traced. In 1885, Thomas Twyford developed the vitreous china toilet. The idea was soon emulated by other manufacturers. A comparative study of the history of the evolution of bathroom will show that it found its way into America as it got popularized in Europe. From 1875 onwards different kinds of toilets were devised. As toilets became widespread, they finally became an inevitable part of almost every house. The innovations kept on improving and finally it eliminated the problems of methane gas effervescing. At the termination of World War I, the toilet was modified into a permanent fixture in most American homes. 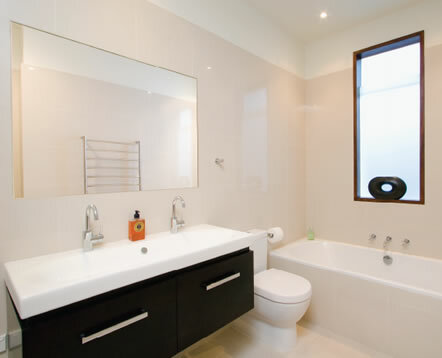 The evolution of the bathroom is an excellent example of how people immediately felt the urge for hygiene. With the passage of time, it became a complementary part of every home and an expression of civility.